Prime Bank Head of Consumer Banking ANM Mahfuz and Six Seasons Hotel Executive Assistant Manager Md Al Amin exchange documents after signing an agreement on buffet dinner in the capital recently. 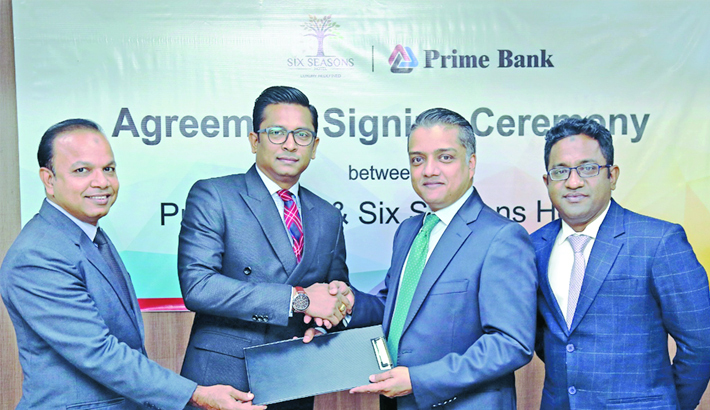 Prime Bank recently signed an agreement with Six Seasons Hotel at the bank’s head office in the capital. ANM Mahfuz, Head of Consumer Banking of Prime Bank and Md. Al Amin, Executive Assistant Manager of Six Seasons Hotel, signed the agreement on behalf of their respective sides, said a press release. Under the deal, Prime Bank’s Platinum, World MasterCard and Monarch Prestige Cardholders will enjoy Buy One Get One offer on buffet breakfast, lunch and dinner.